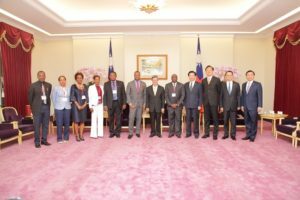 August 23, 2017 (Taipei, Taiwan) – A delegation from Saint Kitts and Nevis headed by the Minister of Foreign Affairs, the Honourable Mark Brantley, and accompanied by the Honourable Eugene Hamilton and the Honourable Alexis Jeffers, on August 22, 2017, had an audience with Dr. Chen Chien-jen, Vice-President of the Republic of China (Taiwan). In his welcoming remarks to the delegation, Vice-President Chen, outlined areas of convergence with the Government of Taiwan, and the Team Unity Government, noting that both are trying to create an equitable and inclusive society with both having the desire for the benefits to be shared by all citizens. The Vice-President also referenced several on-going projects between Taiwan and Saint Kitts and Nevis including the health related project designed to address non-communicable diseases and in particular renal diseases. Vice-President Chen, who is a trained physician, also spoke of the importance of early screening for health related issues and reiterated Taiwan’s eagerness to assist the Federation in its ongoing efforts of the prevention and detection of renal diseases. The Vice-President also stated that Taiwan tries to share its experience in many areas, while promoting bilateral exchanges, adding that Taiwan is a good global citizen that is desirous of contributing more on the world stage. In his response, Minister Brantley lauded the strides made by the Government of Tsai Ing-wen and expressed the gratitude of the Team Unity Government for Taiwan’s strong support in the field of health, education and security, among others. The Federation’s push toward renewable energy, the improved security systems and the increased educational opportunities aided by Taiwan, were all mentioned by Foreign Minister Brantley as having a positive impact on the lives of the citizens of Saint Kitts and Nevis. The Foreign Minister also pledged the continued support of the Team Unity Government for Taiwan’s inclusion and meaningful participation in international forums. While reiterating the importance of the health project, Minister Hamilton, the Federation’s Health Minister, also thanked the government of Taiwan for the specialized training of health professionals currently being taught in Taiwan while Minister Jeffers of the Nevis Island Administration reiterated his thanks for the ongoing agricultural projects on the island of Nevis. Mrs. Juliette Hamilton, Mrs. Nicole Slack-Liburd, and Mr. Kevin Barrett along with H.E. Ambassador Jasmine Huggins also accompanied the delegation.